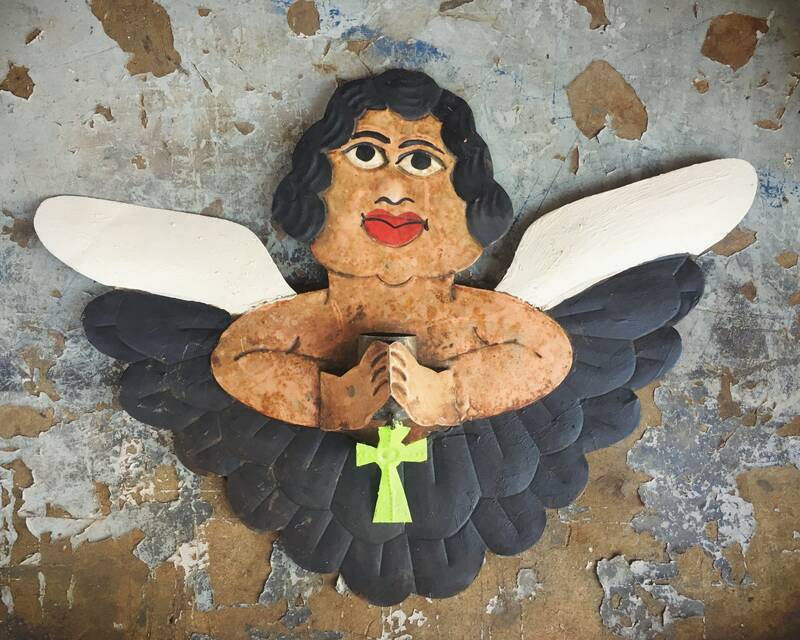 The older metal angel is recognizable as Nahua folk art from Guerrero, Mexico, and is circa 1960s. 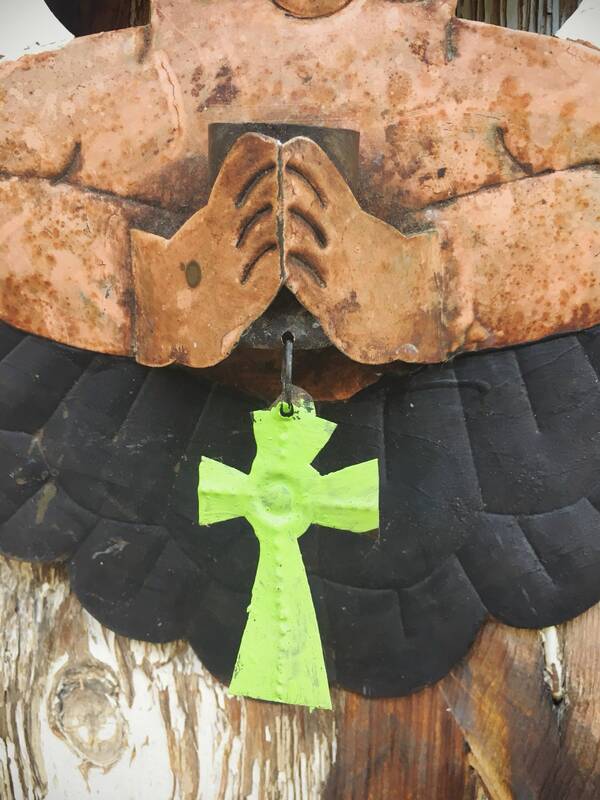 I've collected and sold Nahua angels carved of wood yet have never seen a metal one such as this. 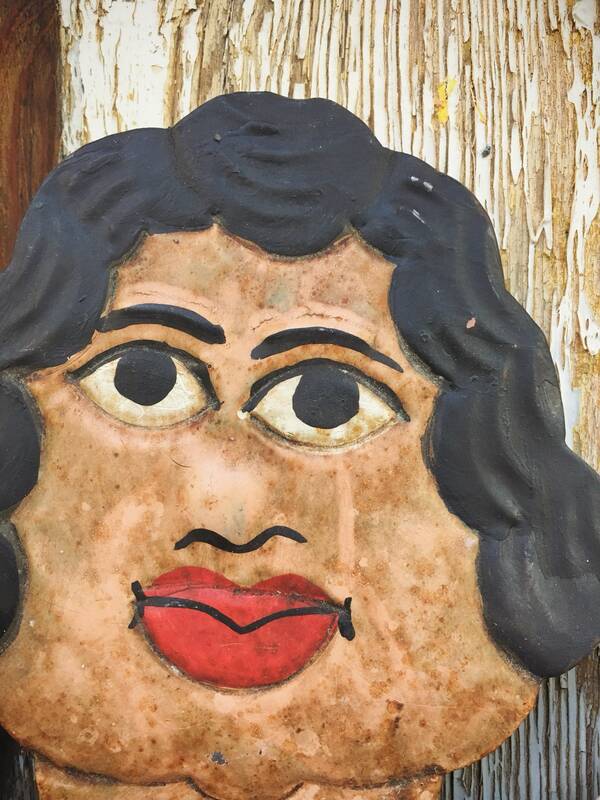 And my research has turned up no other one, made of met yet with the same whimsical, almost comical expression as found on the wood carvings. 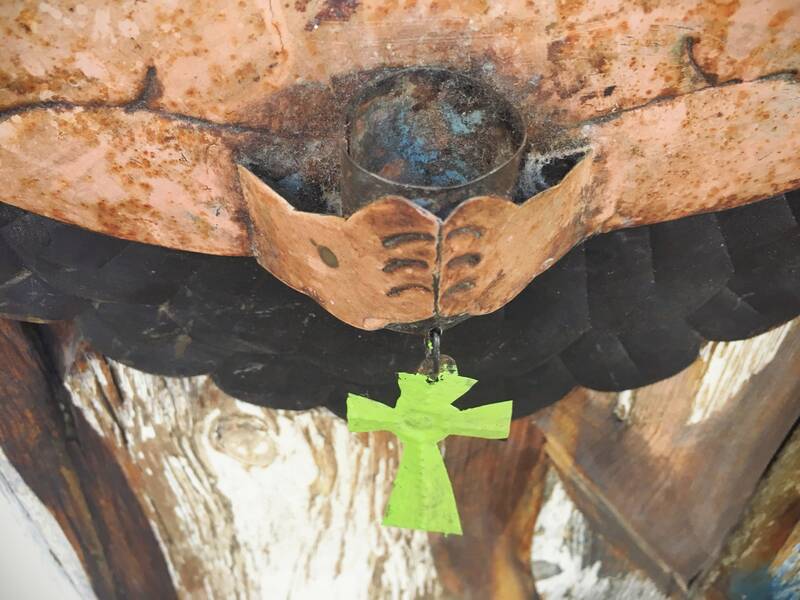 Her hands come out from the metal base to hold a conical candle holder, from which hangs a bright almost neon green cross. 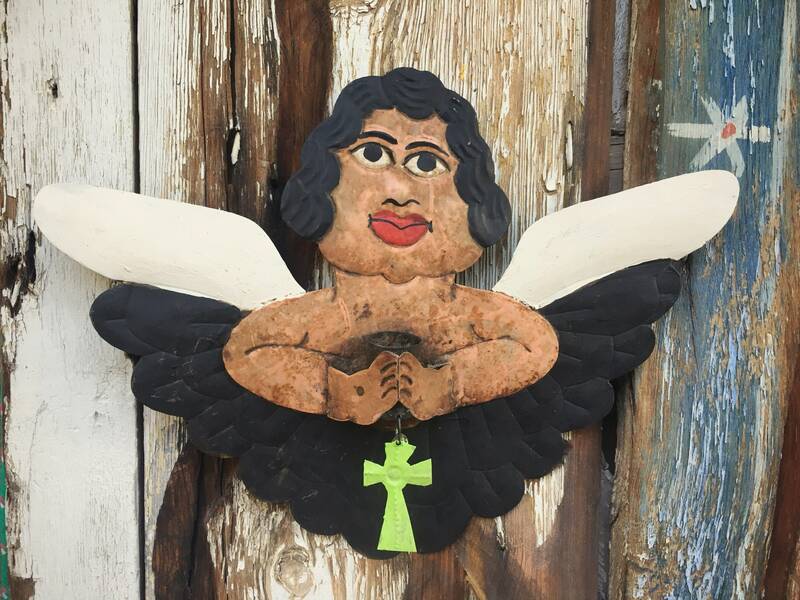 The piece has a wire hanger on the back, and in Mexico these angels are often hung on courtyard walls with many other types of angels, and wall planters, and other folk art. Given the wear on this piece, which is mostly in the form of surface dirt that is ground in, I believe this piece was kept outdoors on a wall sheltered from sun yet not dirt. I think what I love most is that there is a tear streak coming down from her eye on our right. I don't think this was intentionally painted in but rather a pattern left by the grime and perhaps then having gotten wet. I normally would clean a piece like this off as much as possible, but I am so enamored of that streak that I am leaving this in all its gritty glory. 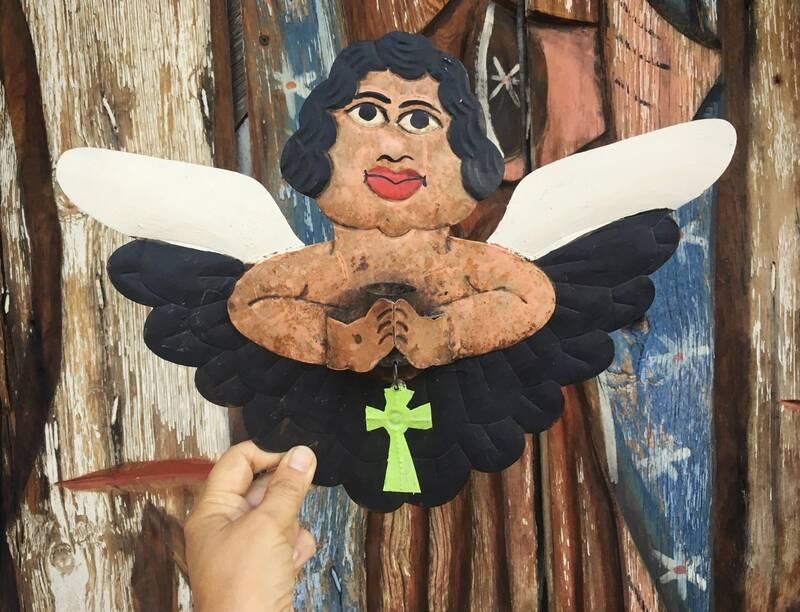 The angel measures about 14-1/2" across at the widest point by about 11" tall at the tallest point, and the hands extend out a little over 1" from the flat base. There are many spots of rust, especially along her arms and on the back. 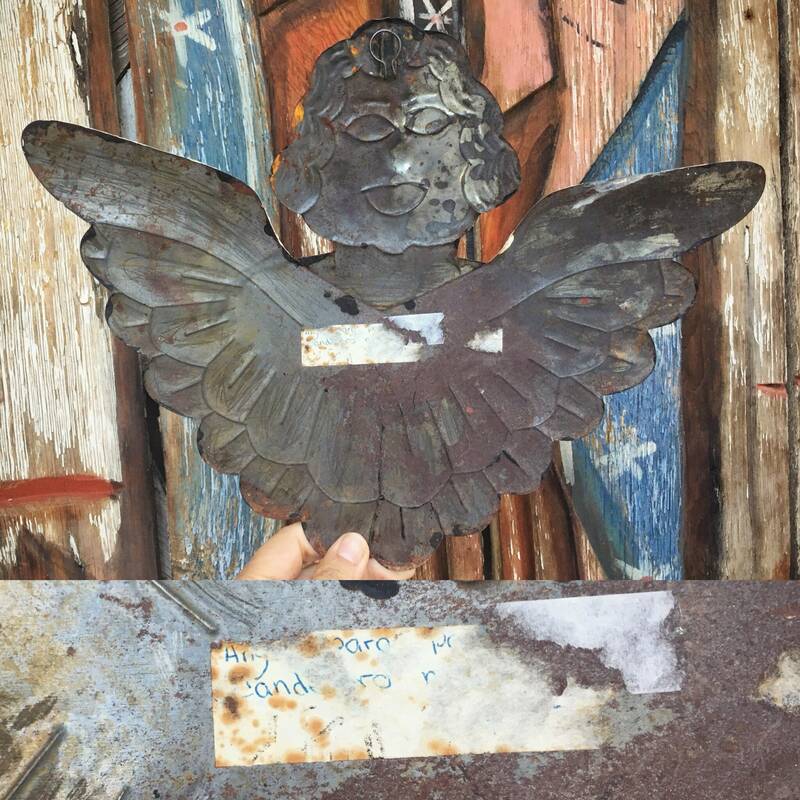 I've kept an old sticker on the back that may have said something about the provenance although it is no longer legible and that, too, has rust. 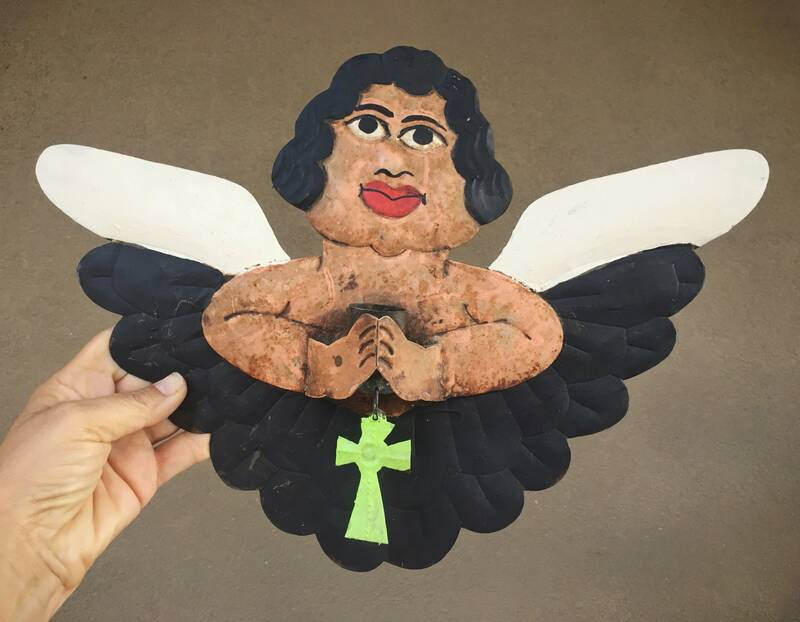 Absolutely charming piece of religious folk art, for the lover of angels or Mexico or Latin America. I love her!! Description and photos were right on, so I knew just where to put her, and sure enough, she looks perfect! Delivery was speedy. She was so protectively wrapped, she wouldn't have been fazed if delivery had been by plane drop. There couldn't be a better seller... so responsive and kind. Wonderful experience! !